and hopes of The Council of Birmingham and West Midlands Jewry to clean and restore it. The cemetery was opened around 1851 when the ground was presented by the Duke of Sutherland to the Jewish community. 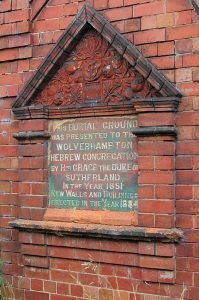 The dedication plaque reads: This burial Ground was presented to the Wolverhampton Hebrew Congregation by His Grace the Duke of Sutherland in the year 1851. New walls and buildings erected in the year 1884. 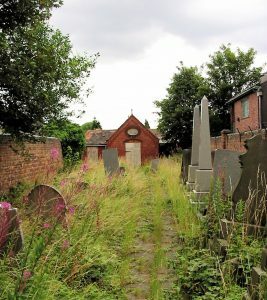 “I am hoping to contact people who have relatives buried in the Wolverhampton Jewish Cemetery, which is no longer in use. The first burial there was in 1866 and the last in 2000. The Representative Council of Birmingham and West Midlands Jewry, together with the Board of Deputies, are looking to have the grounds commercially cleared, as they have become overgrown and a dumping ground for unwanted household goods. Once cleared, the grounds will be maintained by a team of volunteers from the Birmingham community. The ohel, which is a listed building, requires renovation at a cost of approximately £25,000, without which it will eventually fall down. I hope families whose relatives are interred there, and others, regardless of whether they have relatives there or not, will consider making a donation no matter how small, to ensure that the cemetery once again becomes a dignified and respectable final resting place. For details of those buried there and recorded on CemeteryScribes can be found here.